Copyright 2008 � Australian Mathematical Society . This article presents new applications of recursive identification methods to estimation of ship manoeuvring dynamics and hydrodynamics. 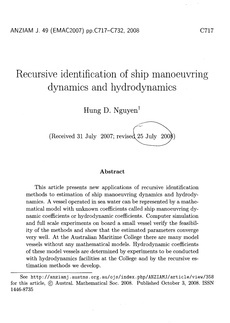 A vessel operated in sea water can be represented by a mathematical model with unknown coefficients called ship manoeuvring dynamic coefficients or hydrodynamic coefficients. Computer simulation and full scale experiments on board a small vessel verify the feasibility of the methods and show that the estimated parameters converge very well. At the Australian Maritime College there are many model vessels without any mathematical models. Hydrodynamic coefficients of these model vessels are determined by experiments to be conducted with hydrodynamics facilities at the College and by the recursive estimation methods we develop.